you may have noticed the new blog name. i felt it was necessary. we'll see how long it lasts. it was a random thought. we have now been back from "me-hee-co" for a couple of days and this house may never be "normal" again. at this point it looks a lot more like a storage unit than a dwelling place. and brad's stuff...well, i have tried to make room for it, but it may take several attempts at closet-clearing to get the job done. i guess i need to let go of some things i keep telling myself i'll wear and get on with it. and we definitely need to have a garage sale. me-hee-co was great, but i must admit we were ready to get home. i can only handle so much 7-up (didn't drink the water) and haggling in the streets (but i must say, we got pretty good at ignoring people. maybe that is not such a good thing?) i wish i had a recording to share with you to demonstrate the way they would croon, in very thick accents, "honeymooners" as we walked down 5th street. 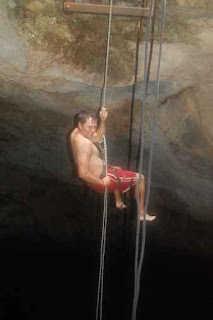 1 -- rappelled 45 feet from the earth into an underground, fresh-water (ie COLD), 60-foot deep cenote. the water was unbelievably clear; you could follow the ray of light (from the opening above us) all the way down to the ground under the water. after hanging out in there for a while, we climbed a very tall rope ladder. fun! 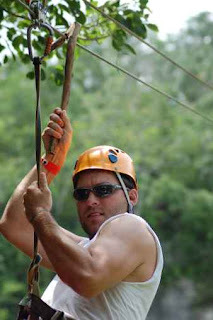 3 -- climbed a 130-foot ancient pyramid at the coba ruins. 4 -- volleyball on the beach. 5 -- hiked through a jungle, then zip-lined it across a cenote while looking straight down at two crocs in the water below. 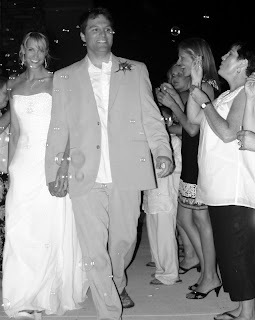 as for the wedding...it was wonderful. i have said this before, but i could not have imagined anything better (i feel it's worth repeating because i can't really get over it). the music was absolutely incredible. i would be willing to pay a decently large amount of money for a cd of the performances so i can listen to the songs every day. we were also told some guy in a boat watched the wedding from right behind us. this story has yet to be confirmed. thanks so much to all who helped to make this day better than a dream come true! Sounds like the best honeymoon ever! and yes.... I will confirm the guy in the boat. Never will forget that. It was a great wedding. I look forward to spending some time with the Lotzs. 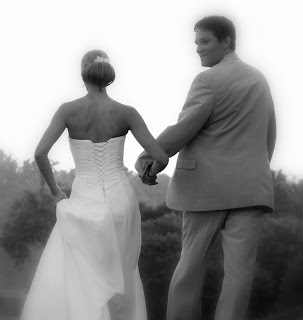 What beautiful pictures of your wedding on Hillen's blog. He really did catch some exciting pictures. My favorite is probably the one of your face with what looks to be cake frosting on your nose. You have the sweetest, most loving look in your eyes. That pic is definately a keeper. Congratulations to the both of you. You make a lovely couple. sounds like you guys had a great time. Don't worry, you will be wanting to go back soon, I guess costa will have to do. Hey, totally random but I was talking to Crystal Wooten a while back and apparently you all are my neighbors! If you ever need anything I am the blue house on the corner. You know... across the street from the crazy guy who likes to sun bathe in his underwear and has an amazingly loud dog??? Congrats on the wedding, looks beautiful!